ATA Appliance Repair Company recognizes its obligation to its customers, community and online visitors to adhere to the highest standards of decency, fairness, and integrity in all its operations. Likewise, we're dedicated to the fundamentals of protecting consumer privacy on the Internet. 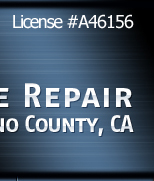 ATA Appliance Repair Company only collects personal information from our visitors on a voluntary basis. We don't require this information to obtain access to any of our sites. Personal information received from any visitor will only be used for internal ATA Appliance Repair Company purposes and will not be sold or provided to third parties. Personal information may include name, address, email address, age, etc., and may be collected for entry forms, requests for information from ATA Appliance Repair Company, to join our updates list, etc. We may also occasionally ask, on a voluntary basis for personal information for our internal use, such as marketing and research. We'll maintain your privacy and will not sell or provide this information to third parties.